Buy Prada SPR 62V sunglasses online at a friendly price. Originally made in 2018, Prada PR 62VS are lightweight metal frames. Each pair of authentic Prada sunglasses ships worldwide with authenticity certificate, Prada box, case and a cleaning cloth. Buy Prada SPR 61V sunglasses online at a friendly price. Originally made in 2018, Prada PR 61VS are lightweight metal frames. Each pair of authentic Prada sunglasses ships worldwide with authenticity certificate, Prada box, case and a cleaning cloth. Buy Prada SPR 53V sunglasses online at a friendly price. Originally made in 2018, Prada PR 53VS are lightweight metal frames. Each pair of authentic Prada sunglasses ships worldwide with authenticity certificate, Prada box, case and a cleaning cloth. Buy Prada SPR 50V sunglasses online at a friendly price. Originally made in 2018, Prada PR 50VS are lightweight metal frames. Each pair of authentic Prada sunglasses ships worldwide with authenticity certificate, Prada box, case and a cleaning cloth. Buy Prada SPR 02VF sunglasses online at a friendly price. Originally made in 2018, Prada PR 02VSF are lightweight plastic frames. Each pair of authentic Prada sunglasses ships worldwide with authenticity certificate, Prada box, case and a cleaning cloth. Buy Prada SPR 02V sunglasses online at a friendly price. Originally made in 2018, Prada PR 02VS are lightweight plastic frames. Each pair of authentic Prada sunglasses ships worldwide with authenticity certificate, Prada box, case and a cleaning cloth. Buy Prada SPR 01VF sunglasses online at a friendly price. Originally made in 2018, Prada PR 01VSF are lightweight plastic frames. Each pair of authentic Prada sunglasses ships worldwide with authenticity certificate, Prada box, case and a cleaning cloth. Buy Prada SPR 01V sunglasses online at a friendly price. Originally made in 2018, Prada PR 01VS are lightweight plastic frames. Each pair of authentic Prada sunglasses ships worldwide with authenticity certificate, Prada box, case and a cleaning cloth. Buy Prada SPR 64U sunglasses online at a friendly price. Originally made in 2018, Prada PR 64US are lightweight metal frames. Each pair of authentic Prada sunglasses ships worldwide with authenticity certificate, Prada box, case and a cleaning cloth. Buy Prada SPR 63U sunglasses online at a friendly price. Originally made in 2018, Prada PR 63US are lightweight metal frames. Each pair of authentic Prada sunglasses ships worldwide with authenticity certificate, Prada box, case and a cleaning cloth. Buy Prada SPR 61U sunglasses online at a friendly price. Originally made in 2018, Prada PR 61US are lightweight metal frames. Each pair of authentic Prada sunglasses ships worldwide with authenticity certificate, Prada box, case and a cleaning cloth. Buy Prada SPR 20U sunglasses online at a friendly price. Originally made in 2018, Prada PR 20US are lightweight plastic frames. Each pair of authentic Prada sunglasses ships worldwide with authenticity certificate, Prada box, case and a cleaning cloth. Buy Prada SPR 19U sunglasses online at a friendly price. Originally made in 2018, Prada PR 19US are lightweight plastic frames. Each pair of authentic Prada sunglasses ships worldwide with authenticity certificate, Prada box, case and a cleaning cloth. Buy Prada SPR 18U sunglasses online at a friendly price. Originally made in 2018, Prada PR 18U are lightweight plastic frames. Each pair of authentic Prada sunglasses ships worldwide with authenticity certificate, Prada box, case and a cleaning cloth. Buy Prada SPR 17UF sunglasses online at a friendly price. Originally made in 2018, Prada PR 17USF are lightweight plastic frames. Each pair of authentic Prada sunglasses ships worldwide with authenticity certificate, Prada box, case and a cleaning cloth. Buy Prada SPR 17U sunglasses online at a friendly price. Originally made in 2018, Prada PR 17US are lightweight plastic frames. Each pair of authentic Prada sunglasses ships worldwide with authenticity certificate, Prada box, case and a cleaning cloth. Buy Prada SPR 16UF sunglasses online at a friendly price. Originally made in 2018, Prada PR 16USF are lightweight plastic frames. Each pair of authentic Prada sunglasses ships worldwide with authenticity certificate, Prada box, case and a cleaning cloth. Buy Prada SPR 16U sunglasses online at a friendly price. Originally made in 2018, Prada PR 16US are lightweight plastic frames. Each pair of authentic Prada sunglasses ships worldwide with authenticity certificate, Prada box, case and a cleaning cloth. Buy Prada SPR 59U sunglasses online at a friendly price. Originally made in 2018, Prada PR 59US are lightweight metal frames. Each pair of authentic Prada sunglasses ships worldwide with authenticity certificate, Prada box, case and a cleaning cloth. Buy Prada SPR 58U sunglasses online at a friendly price. Originally made in 2018, Prada PR 58US are lightweight metal frames. Each pair of authentic Prada sunglasses ships worldwide with authenticity certificate, Prada box, case and a cleaning cloth. Buy Prada SPR 57U sunglasses online at a friendly price. Originally made in 2018, Prada PR 57US are lightweight metal frames. Each pair of authentic Prada sunglasses ships worldwide with authenticity certificate, Prada box, case and a cleaning cloth. Buy Prada SPR 56U sunglasses online at a friendly price. Originally made in 2018, Prada PR 56US are lightweight metal frames. Each pair of authentic Prada sunglasses ships worldwide with authenticity certificate, Prada box, case and a cleaning cloth. Buy Prada SPR 14U sunglasses online at a friendly price. Originally made in 2018, Prada PR 14US are lightweight plastic frames. Each pair of authentic Prada sunglasses ships worldwide with authenticity certificate, Prada box, case and a cleaning cloth. Buy Prada SPR 13U sunglasses online at a friendly price. Originally made in 2018, Prada PR 13US are lightweight plastic frames. Each pair of authentic Prada sunglasses ships worldwide with authenticity certificate, Prada box, case and a cleaning cloth. 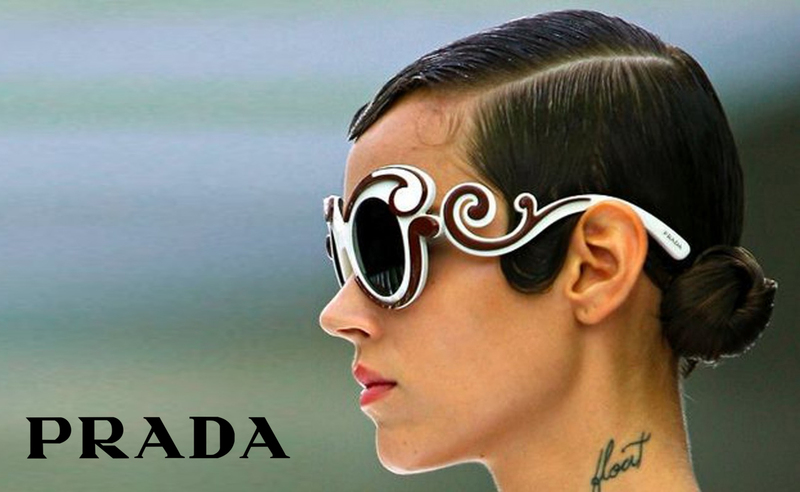 Buy Prada SPR 12U sunglasses online at a friendly price. Originally made in 2018, Prada PR 12US are lightweight plastic frames. Each pair of authentic Prada sunglasses ships worldwide with authenticity certificate, Prada box, case and a cleaning cloth. Buy Prada SPR 68T sunglasses online at a friendly price. Originally made in 2017, Prada PR 68TS are lightweight metal frames. Each pair of authentic Prada sunglasses ships worldwide with authenticity certificate, Prada box, case and a cleaning cloth. Buy Prada SPR 67T sunglasses online at a friendly price. Originally made in 2017, Prada PR 67TS are lightweight metal frames. Each pair of authentic Prada sunglasses ships worldwide with authenticity certificate, Prada box, case and a cleaning cloth. Buy Prada SPR 66TF sunglasses online at a friendly price. Originally made in 2017, Prada PR 66TSF are lightweight metal frames. Each pair of authentic Prada sunglasses ships worldwide with authenticity certificate, Prada box, case and a cleaning cloth. Buy Prada SPR 66T sunglasses online at a friendly price. Originally made in 2017, Prada PR 66TS are lightweight metal frames. Each pair of authentic Prada sunglasses ships worldwide with authenticity certificate, Prada box, case and a cleaning cloth. Buy Prada SPR 65T sunglasses online at a friendly price. Originally made in 2017, Prada PR 65TS are lightweight metal frames. Each pair of authentic Prada sunglasses ships worldwide with authenticity certificate, Prada box, case and a cleaning cloth. Buy Prada SPR 64T sunglasses online at a friendly price. Originally made in 2017, Prada PR 64TS are lightweight metal frames. Each pair of authentic Prada sunglasses ships worldwide with authenticity certificate, Prada box, case and a cleaning cloth. Buy Prada SPR 63T sunglasses online at a friendly price. Originally made in 2017, Prada PR 63TS are lightweight metal frames. Each pair of authentic Prada sunglasses ships worldwide with authenticity certificate, Prada box, case and a cleaning cloth. Buy Prada SPR 62T sunglasses online at a friendly price. Originally made in 2017, Prada PR 62TS are lightweight metal frames. Each pair of authentic Prada sunglasses ships worldwide with authenticity certificate, Prada box, case and a cleaning cloth. Buy Prada SPR 53U sunglasses online at a friendly price. Originally made in 2017, Prada PR 53US are lightweight metal frames. Each pair of authentic Prada sunglasses ships worldwide with authenticity certificate, Prada box, case and a cleaning cloth.